Brighten your little one’s bedroom with this ultra cute Roly Poly crocheted panda quilt. The colorful piece is guaranteed to add a splash of life and color to your baby’s space! In fact, this pattern is an ideal project for intermediate crocheters to work on. They will definitely enjoy working on this rewarding piece. Once completed, the crocheted baby blanket should measure approximately 32 inches by 37 inches in size. In metric units, the finished crocheted quilt should be about 82 cm by 94 cm in size. This crochet pattern is an awesome design by Nadia Fuad, the talented crafter behind Yarn Utopia. 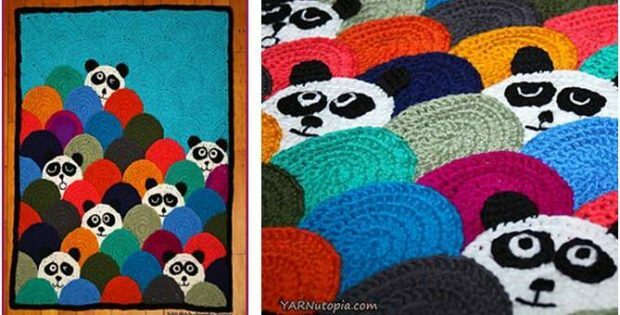 In fact, you can access the FREE pattern for this colorful crocheted panda quilt from her website. Featured image: Yarn Utopia/ Nadia Fuad – thank you!